One of the more frequent questions I am asked is about removing walls. Everyone seems to want the “Open Concept” and the first item of business is to remove or modify a wall. The easiest way to determine whether or not you can remove a wall is to head down to your basement. House are designed so that their framing transfers the load down to the foundation. Using this knowledge as a reference, we can look in the basement for footings with support walls, which will then tell us that this load has to be transferred down from a supporting wall above. This method will determine your location of support walls and columns on your main floor. If you have a single level bungalow you might not have a single support wall on the main floor. Looking in your attic will determine whether you have rafters or trusses. If you have trusses then you have no support walls required to carry your roof load as they typically span from exterior wall to exterior wall. Beware of custom built homes that may have engineered trusses that may be on supporting walls. Before moving or removing any walls it is recommended you consult with your local building department, a qualified carpenter and / or an engineer or registered designer. Any structural changes to your home will require a building permit from local building department. Any support walls in your home will start in the basement and continue up through house. Support walls in basement are easy recognized as they will be on a footing and any openings will have headers installed. Some new homes will have steel beams with steel posts installed on concrete footings in basement. 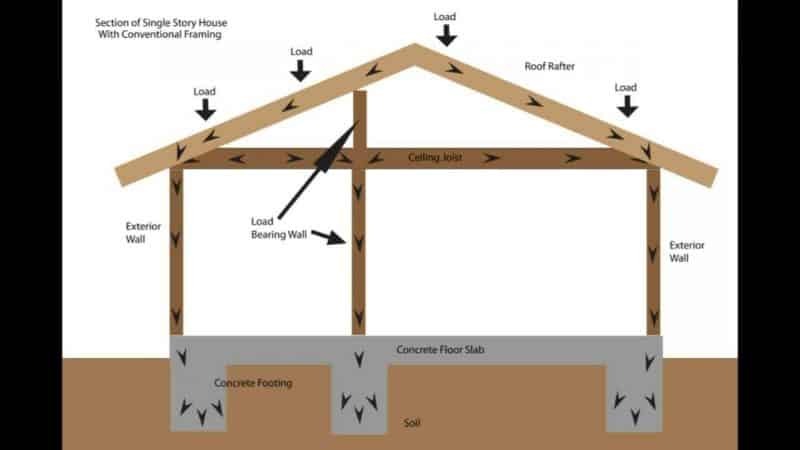 Your foundation carries the whole load of your house, which includes roof and snow load. Any interior columns or support walls have to be supported by a footing that is designed based on height of structure and whether or not is has to support brick veneer or masonry block construction. Note: On wet soil conditions the size of footings are required to be doubled. Footing depth must be equal to footing projection and no less than 4 inches thick. All footings are required to constructed on undisturbed soil, rock or compacted granular fill. Openings in walls should always have a lintels and header boards installed, this will prevent problems with doors and windows opening due to load not being properly carried. Roof trusses and engineered floor joists come under Part 4 of the Ontario Building Code. If you modify or use a truss or joist for any other purpose other than what it was designed for, you will require a detail drawing stamped by engineer or registered designer. Many home owners will hang storage units from garage trusses that were designed for supporting roof load only. Poured concrete foundation walls are the best choice for lateral support. Masonry block constructed foundation walls rely on floor for lateral support. Many poured concrete walls have crack control joints installed which are sealed with a water impermeable material. The purpose of these control joints is to allow shrinkage cracks to occur in a predictable location. Steel columns used to support beams in basements of houses must be designed in accordance with Part 4 of the Ontario Building Code. The top plate of column must cover the width of beam it is supporting and column has to be secured at both top and bottom of post. This columns are also required to be anchored at both top and bottom. The Barrie home inspector always tries to determine if movement in a home was caused by human error during construction or structural movement of home usually caused by expansive soils or moisture problems in the supporting soil. When purchasing a home which has a Fireplace or Wood Stove, typically your insurance company will require a Site Basic WETT Inspection. Barrie Home Inspections provides this service for $50.00 as part of home inspection package.